Decisions. Decisions. Each day we make thousands of decisions ranging from whether or not to hit the snooze button to how much honey to use in our tea. In fact, it is estimated that Americans make approximately 35,000 decisions in a single day. While you may be aware of the major decisions in your life, many of the everyday mundane decisions are made in your subconscious mind. If you are reading this, there is a very good chance that you’ve already had to make some significant decisions when it comes to your health. Perhaps you’ve been diagnosed with osteoporosis or osteopenia, and that prescription medication is your only hope for reversing bone loss. While Savers know that osteoporosis drugs actually harm bones, some may consider taking the recommended medications out of fear-based decision making. As you venture along your journey to wellness, it’s important to examine your own decision-making process. Understanding the science behind decisions, as well as how outside influences guide your decisions, is a critical aspect of good health. Once you know how decisions are made, you can stand confidently in your choices. Decision making, by definition, is the process of preparing an option or a course of action over alternatives on the basis of given criteria or strategies.1 While this simplified explanation is accurate, decision making is so much more than weighing options and choosing the best one. When faced with a choice, many factors influence our decision-making processes, including our subconscious minds. Some factors that influence our decisions are past experiences2, cognitive biases3, age or individual differences4, belief in personal relevance5, and fear, just to name a few. We frequently weigh our decisions based on past experiences, although we are often unaware that we are doing so. For example, you may have grown up being told that milk is healthy and important for your bones. You received cartons of milk in school, and watched the “Got Milk” ads. Your experience with milk became ingrained in your psyche. However, mounting evidence has shown that rather than being healthy, milk is damaging to our bones.6 Despite this fact, it may be challenging to let go of your past experiences. The same applies to the way in which your past experiences influence your food choices. In fact, some studies have shown that food preferences are established as early as in utero and continue to develop during the breastfeeding years.7 In an 8-year longitudinal study, fruit and vegetable consumption by school-aged children was predicted by either breastfeeding duration, food-related experiences during early life, or mothers’ preferences.8 Our past experiences program our brains, thus impacting future decisions. Cognitive biases affect our decisions as well. For example, the placebo effect is a cognitive bias in which simply believing that something will have a particular effect causes it to have that effect. If you are told that you have osteoporosis, and you internalize it as a disease, then you are more likely to develop further bone loss. 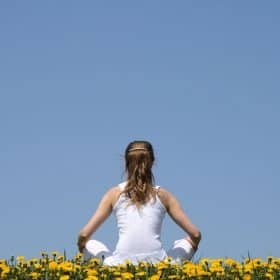 The mind-body connection is becoming a more widely accepted approach. Another cognitive bias is the confirmation bias. While we all experience confirmation biases, they become particularly dangerous in medicine. For example, perhaps a physician prescribed a controversial medication to a patient, who then subsequently became well for another reason. In response to feeling good, the patient praises the doctor. The doctor then prescribes the medication more often, with few successes and many more failures. However, the physician is apt to remember the successes, as it confirms his or her belief that the medication is doing its job. Free will is the ability to act at one’s own discretion. While we would like to believe that we are completely in charge of our decisions, studies have shown that our freedom of choice may be an illusion.9 On a subconscious level, many factors influence our brains. This same concept also applies to television ads for pharmaceutical drugs. The United States is one of only two countries in the world to allow Big Pharma to advertise prescription drugs directly to the consumer. The pharmaceutical industry has taken advantage of those concerned about their bone health. For example, Fosamax had annual sales of $3 billion until its U.S. patent lapsed in 2008 and generic versions of the popular osteoporosis drug flooded the market. It’s important to recognize that advertisements and messages that we hear around us erode our free will. If we are aware of this fact, we can evaluate our decisions more objectively. You’ve probably heard the adage “Go with your gut.” Perhaps you are aware of our “sixth sense.” Our instincts are an amazing collection of all of our subconscious experiences over our lifetimes, and maybe even before we were born. However, before you can follow your gut, you must be able to hear it, and that requires giving ourselves the time to quiet our bodies and minds. When broken down to a basic level, our primal instinct is for survival. Let’s pretend that you are in your doctor’s office and you have just been told that you have osteoporosis. Your doctor lists your options, emphasizing that drugs are your best chance for stopping bone loss. Your first instinct might be to grab the prescription and run to the nearest pharmacy, after all, your health depends on it. However, when you take a moment to reflect on the interaction, you realize that your body is smart and that there are effective drug-free tools to reverse bone loss without the unhealthy side effects. Your body is wired for survival, and intuition is one of the ways that your body protects itself. Fear plays a significant role in the health choices that we make. Many of us grew up in an age where our doctors were viewed as the all-knowing medical experts. While well intentioned in most cases, physicians often use fear-based tactics to influence the treatment choices patients make. Patients often follow the advice of their doctors out of fear. They are afraid of the worst possible outcome, or they are scared of making their physician angry if they don’t follow their advice. Unfortunately, fear and stress create biochemical reactions that have adverse consequences on bone health. The body responds to fear by releasing adrenaline, epinephrine and cortisol. As explained in the Osteoporosis Reversal Program, cortisol is harmful to bones. Additionally, excess adrenaline elevates blood pressure and suppresses immunity and digestion, all of which impact long-term bone health. Decisions made under duress may not be sound. 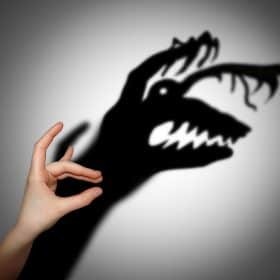 Fear often triggers the fight or flight response, which hinders any ability to make healthy decisions. One of the best ways to eliminate fear is to acquire knowledge. Also, self-awareness can go a long way to calm your fears. Motivation and decision making are intricately linked. Motivation establishes the purpose of the decision-making process. While benefits motivate some people, others are driven by aversion to risk. 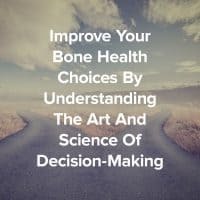 To effectively make a decision, it’s important to evaluate your bone health philosophy and level of motivation. For example, if you have been told that you are losing bone, how motivated are you to make the changes necessary to reverse your bone loss? Are you motivated by the possibility of feeling healthy and alive? Or, rather, are you motivated by the fear of becoming increasingly weak and ill. Both are valid motivations, and fully understanding your motivations will help you make better decisions. Conventional treatment recommendations for osteoporosis typically include medications. It is rare that a health practitioner suggests diet and lifestyle modifications as a first-line treatment strategy. Even when doctors recommend diet and exercise changes, their suggestions are not always based on science. 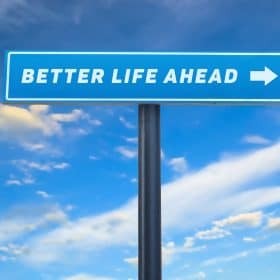 If you decide to follow the Osteoporosis Reversal Program, friends and family may question your choice. It’s highly unlikely that people in your social circle will understand when you explain that osteoporosis is not even a disease. They may criticize your decision to go against the recommendations of conventional medicine. However, with time and education, you will feel strong and rooted in your beliefs. The philosophy of the Osteoporosis Reversal Program is precisely the opposite of herd mentality. Through the use of scientific evidence, Savers are regaining their bone health and vitality. Despite the fact that many factors subtly impact our choices, the decision to choose is still quite remarkable. Unfortunately, questioning the status quo, critical thinking, and evaluating evidence are not universally taught or learned in our society. As with any skill, practice makes perfect. Now that you are aware of the factors that impact your decisions, you can practice making decisions in a more enlightened way. As part of the Save Our Bones community, you are surrounded by like-minded people who are on the same enlightened path as you. Now What? How Do I Make A Decision? Determine your goals and how you wish to achieve them: What is your end-goal when it comes to your bone health? Do you wish to slow bone loss, stop bone loss, or even reverse bone loss? All of these options are valid possibilities, and only you can decide your course of action. Write down your goals and read them daily. Get Informed with evidence-backed data: Earlier in this article, we discussed the concept of free will. The more informed you become, the more you can utilize free will in your decision-making processes. 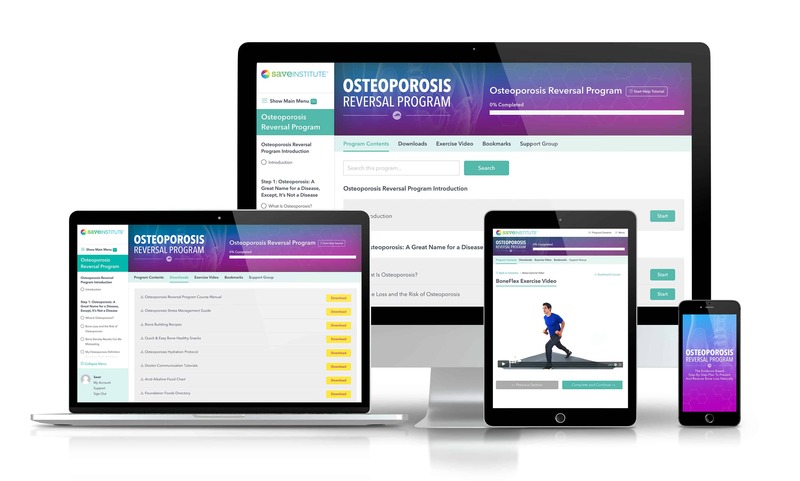 At the Save Institute we aim to provide verifiable scientific data so Savers can feel comfortable with their decisions, and the Osteoporosis Reversal Program contains hundreds of mainstream studies supporting the information it provides. One of the bonuses included in the Program, Doctor Dialogues, gives you effective ways to communicate with your doctor your decision to follow a natural bone health plan without ruining your relationship with him or her. Armed with this information, you’ll feel comfortable with your decision as you embark on your drug-free bone health journey. 1 Wilson, RA, Keil, FC (Eds.). (2001). The MIT encyclopedia of the cognitive sciences. MIT press. 2 Juliusson EÁ, Karlsson N, & Gärling T. Weighing the past and the future in decision making. European Journal of Cognitive Psychology. 2005. 17(4), 561-575. 4 Bruine de Bruin W, Parker AM, Fischhoff B. Individual differences in adult decision-making competence. 5 Acevedo M, Krueger JI. Two Egocentric Sources of the Decision to Vote: The Voter’s Illusion and the Belief in Personal Relevance. International Society of Political Psychology. 2004. 25(1). 115-134. 6 Feskanich D, Willett WC, Stampfer MJ, Colditz GA. Milk, dietary calcium, and bone fractures in women: a 12-year prospective study. American Journal of Public Health. 1997. 87(6):992-7. 7 Mennella JA, Coren P, Jagnow MS, Beauchamp GK. Prenatal and Postnatal Flavor Learning by Human Infants. Pediatrics. 2001;107(6):88–94. 8 Skinner JD, Carruth BR, Wendy B, Ziegler PJ. Children’s food preferences: a longitudinal analysis. Journal of the American Dietetic Association. 2002. 102:1638–1646. I am just finishing 2 years of daily injection of Forteo after having 2 rib fractures and 4 lumbar compression fractures (all non traumatic ( ribs from lifting a table and jumping rope with a personal trainer! ; lumbar from shoveling snow, during a coughing fit; during PT exercise!). I got on forteo out of fear of breaking more bones (it was a painful experience). I have felt tired and concerned the entire 2 years – had jaw pain; knee and hip pain. I believe my genetics do have a role in my tendency towards weak bones but believe it was my diet, lack of exercise and stress prior to the fractures that was most damaging. My doctor discouraged strength exercises out of fear of more fractures so I’ve taken up hiking which I love. But have still not done any strengthening exercises and want to start. I have heard of a raw milk diet that heals the body (no food or exercise, just the raw milk for 3 weeks to heal). I have also heard of bone broth (collagen to form good flexible bones). My doctor wanted to start me on Prolia and I refused. I am now being told I MUST get on a bisphosphonate (Fosomax) because the bones will continue to be broken down for months after stopping the Forteo. I do not want to be on any medication – want to build muscle and bone naturally! Any advice on the raw milk or bone broth and on stopping the forteo without getting on another med will be VERY much appreciated! Ugh…60 years old and very much tired of doctors and meds…want the next 20-30 years to be better than the last 2! Thank you for the kind words, “F”! IT is indeed a great feeling to know you are not obligated to follow the mainstream. I have osteopenia and my doctor ordered Actonel. I told her I did not want to take it, that I had done my homework and would try a more natural drug free way to increase my bone density. Her response was: “I’d stay off the Internet and go get your medical degree if you want to make those decisions”. She was very snarky and angry with me for choosing my own path. I stuck to my guns – no drugs! I think I’ll be looking for another physician soon. Wow, Jan! I am sorry your doctor treated you that way. I hope you are able to find another doctor who will respect your views. I also found this article very life-affirming. I have had to make personal choices re: drugs or natural treatment with an autoimmune disorder (the drugs made me more sick) that I was diagnosed with 25 years ago. So, when I was diagnosed with osteoporosis, I was immediately skeptical that drugs would be the answer for me. The Save Our Bones philosophy of being aware of influences and choices and believing in our body’s ability to heal is something I have found to be paramount in maintaining health and well being. What a perfect fit, Terri! I am so glad you chimed in with your experience and thoughts about the “Saver” approach and what aspects of it are so meaningful to you. Glad you enjoyed it, Sandra! It seems as if you have switched writers. Last article and this one have more typos and this one has some odd language and is not as tightly written as usual. The article states, “you realize that your body is smart and there are nutritional tools that can help you accomplish the same goal of stopping bone loss, without the unhealthy side effects.” This seems to say osteoporosis drugs do stop bone loss — the opposite of what you advocate. Also, it’s a “fight or flight” response, not “flight or flight.” I generally agree with you and appreciate your website, so I hope this is only a temporary lapse. We always strive to deliver the highest possible quality information. Thanks for bringing this to our attention. We’ve corrected it. Your columns are always informative, but this one is especially good. I’m planning on using it with my 12 year old granddaughter about school choices. Preteen/teens respond to ideas when they don’t think they’re directed at them. Thanks for this good tool, for myself and my granddaughter. What a good idea, Marsha. You’re right that kids that age tend to respond better when things are indirectly presented, and what an excellent skill you’ll be sharing with her. She’s lucky to have you for a grandmother.